Aji horse mackerel eaten raw is cut into fillet strips before serving. Fileting horse mackerel is said to be hard to remember but once you got the technique down it is easy. 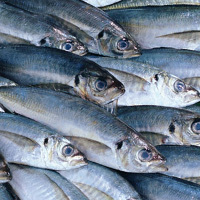 The calories in Horse Mackerel per 25g(1fish edible part) is 30 calories. Horse Mackerel is calculated to be 121Cal per 100 grams making 80Cal equivalent to 66.12g with 5.18g of mostly protein、0.88g of fat、0.03g of carbohydrates in 25g while being rich in vitamins and minerals such as Selenium and Niacin.